Merasia LOVES babies, and of course, she loves EVERYTHING Princess! 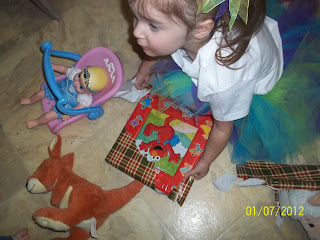 Just in the last 6 months to a year, she has really gotten involved in playing "mommy" with her baby dolls. She loves to pretend to change their diapers, put clothes on them, wrap them in blankets, and pretend to feed them bottles or baby food. I came across Tolly Tots through a friend's blog, and I just knew their products would be perfect for Merasia...and I loved them too! They have a large selection of Disney Princess babies of all varieties, and I love their selection of Graco "baby supplies" for little girls and their babies. 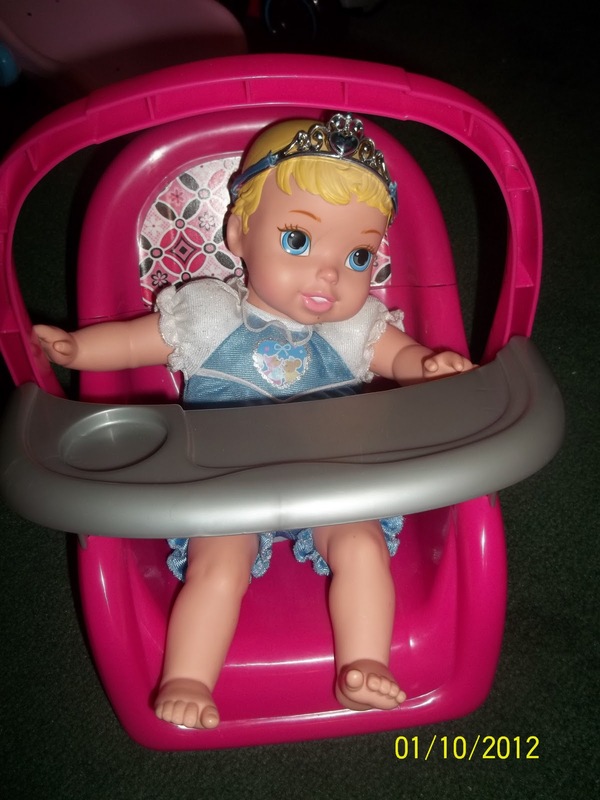 I received the Cinderella Disney Princess Travel With Me baby and car seat/carrier. 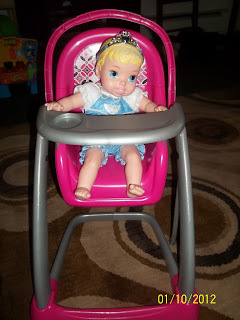 I also received the Graco swing high chair for my review. I received these products just in time for the twins 3rd birthday, and I knew it would make the PERFECT birthday gift! She absolutely loves her baby and it's probably her favorite one now. She wants to take it everywhere with her. 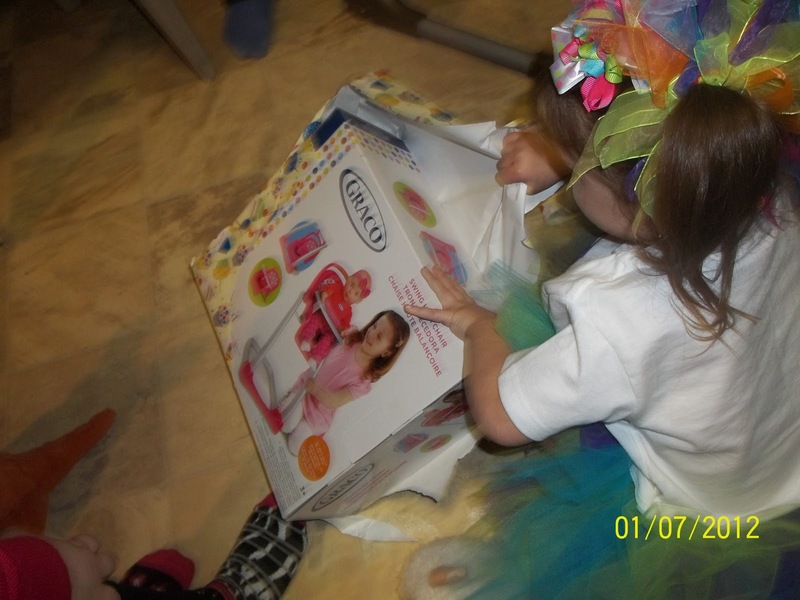 When we took them to en indoor play area and arcade for their actual birthday, she took it with her there and even wanted to take it inside with us. In the van, she likes to have us buckle the baby in between her and Connor's car seats. It's so cute! 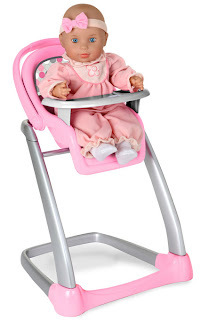 The swing high chair is really neat! It's a high chair, smaller travel swing, and another car seat/carrier, complete with a velcro strap! Merasia LOVES putting her baby in the high chair and pretend to feed her. 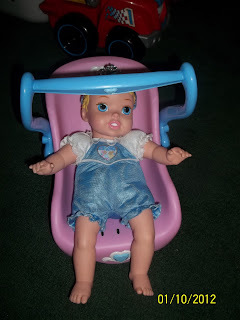 The one thing I would change or suggest to change with the original carrier that the baby doll came with is to add a strap to it, since she falls out easily and Merasia gets frustrated when that happens. But that's a minor issue and something that can easily be fixed! The swing high chair was easy to assemble, it was only a matter of screwing in a couple screws and we were good to go! 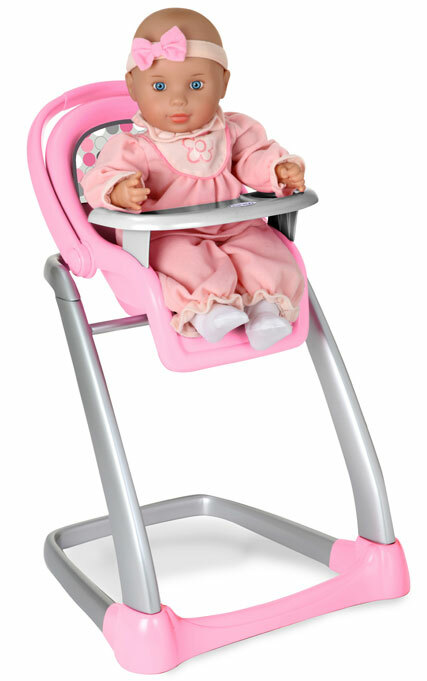 To use it as a swing, there are just two small pink "clips" that attach to the top bar and the swing sets on. I was hesitant that it would work well at first, but it works great! It holds on very securely and is a very well made product. Both of my kids have such fun playing and interacting with the Princess baby and high chair/swing. It's definitely one of their favorite and most used toys...but every time I find them playing with it, I either don't have the camera close by or the batteries are dead! 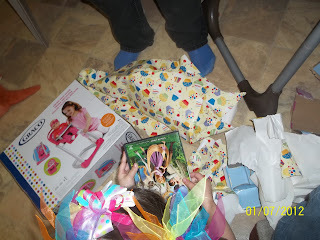 Purchase It: You can purchase these products and many others at a Target, Wal-Mart, or Toys 'R' Us near you! WIN IT: ONE lucky reader of Mama 2 Multiples is going to WIN their very own Princess Travel With Me Baby and car seat/carrier! Follow the instructions in the Rafflecopter form below to enter! READ ALL INSTRUCTIONS CAREFULLY before entering!! Like every single princess thing! Well except for Rapunzel and Belle because we already have them. But Mulan! and Rapunzel's vanity with Pascal on it!! Madelynn would flip! I love the Singing and Storytelling Belle doll! 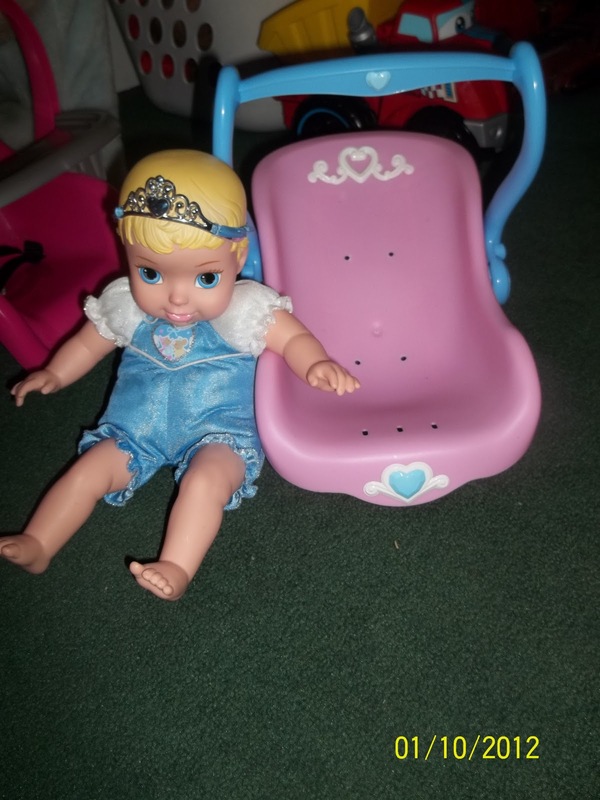 I like the Interactive Baby Princess Cinderella Doll. I love the Rapunzel Enchanted Vanity. I love the aurora interactive doll. I love everything. 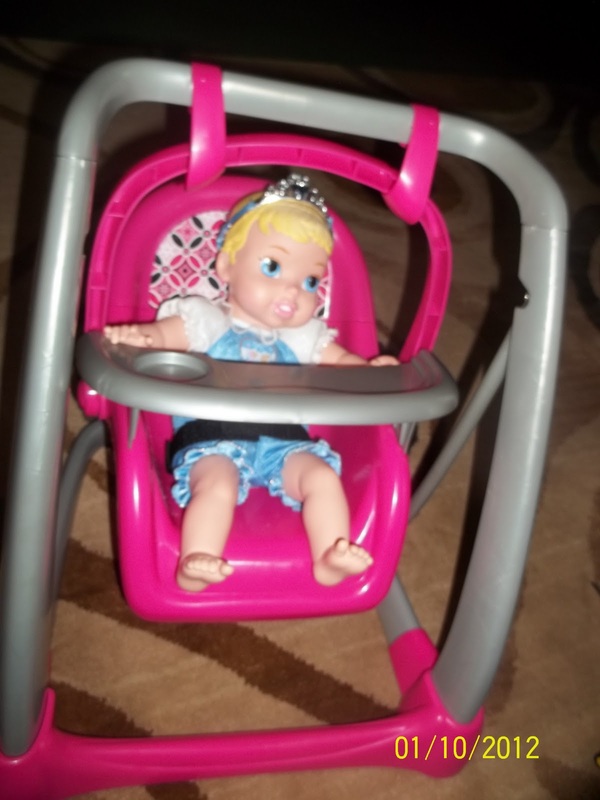 But I know my niece would LOVE the stroller for her dolls. I like the ariel doll.